When you choose cat toys, you should always remember about your cat's safety. The rule number one to follow is to choose toys with the same care you would choose baby toys. • Make sure there are no bits and pieces that could be chewed off, swallowed, get caught on a claw, or get stuck in the cat's throat posing a choking hazard. Avoid toys with shiny metal bits. • Check your cat's toys from time to time looking for signs of wear and tear. Don't let your cat play with toys that are damaged or worn out. • Make sure your cat's scratching posts, trees, and houses are well-secured so your cat doesn't knock them down by accident. • Don't let your cat play with plastic bags, aluminium foil, plastic milk cap rims and the like. They can be extremely dangerous if swallowed. • Always supervise your cat when it's playing with a string. If you cannot do that, don't allow your cat to play with it. Elastic strings and threads can be fatal if swallowed. Cat tongues are covered with sharp, backward-facing barbs. 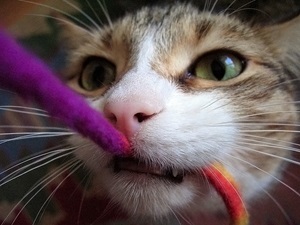 If a string gets caught in them, your cat may find it easier to keep swallowing the string instead of spitting it out. Ingested strings can wrap around the internal organs, causing blockage and injuries. They will often require a surgery to be removed. Luckily, this doesn't always happen. A string can as well pass through the digestive system without causing any problems. However, it's always better to be safe than sorry. If you think your cat has ingested a string, we recommend that you get in touch with your veterinarian. • Get to know your cat. Any inappropriate items your cat would want to play with should be kept out of its reach at all times. • Avoid small balls, yarn, ribbon, tassels, rubber bands, bells and the like as cat toys. • Make sure your cat's toys are non-toxic.